The Moon remains in Scorpio today, but is Void Of Course after 4:56 AM EDT when it opposes Venus in Taurus. This opposition asks us to try and see things from another perspective–especially if there’s a tendency is to hunker down, get all intense and think that if we don’t get what we want, the world will end. Don’t freak out if people dare to disagree with you; pretend you’re an anthropologist and try to figure out what makes them react—that’s a lot more fun. Let them have their hissy fit(s); just go and do something more interesting. Or buy them an ice cream sundae so they can drown their sorrows in pralines-&-cream. Best unsolicited advice: Be a Void-Oid today. The Moon’s Void all day and emotions are intense as we’re still getting blowback from yesterday’s Scorpio Moon eclipse. Don’t start anything new that requires a great deal of concentration, as we’re in space-out city. Make like a Pisces and just go with the flow if things don’t shake out the way you thought they would. (Hint: they won’t.) If you’re still vibrating from that Full Moon/Eclipse energy and feel anxious, the Scorpio/Taurus polarity is fixed and energy tends to crystallize, so find a place where you won’t be disturbed. Stomp around, yell, sing or yodel (how do you think the Swiss handle the stress from being so orderly/running all those trains on time?) Find something breakable that you absolutely hate but have kept around for too long and smash it to bits. (Just be sure to duck shards of broken crockery—you don’t want to land in the hospital!) It’s all very nice to talk about change and transformation in a measured, intellectual way, but sometimes you just have to smash it up. Mars sextile Neptune at 9:46 PM EDT reiterates the message: focus your efforts on the intangible. This is Hanged Man energy. Why is that guy in suspended animation? He’s out-of-reality and is tuning into another channel. This is also Void-of-Course Moon/Neptune energy—the appearance of doing nothing. Under the surface there’s a lot going on, but it’s not always obvious. It’s a great day for psychic and spiritual breakthroughs, so take advantage, whether you’re right-side-up or upside down! Inspiration may strike like a bolt of lightning; put yourself in the right place to get zapped. Go to a museum, buy tickets to a concert, take in a movie, settle in with a good book /e-reader/whatever. Avoid aggressively whimsical people, unless you like that sort of thing, of course. It’s also a good day to take action (Mars) to help the less fortunate (Neptune in Pisces)—donate to a charity, volunteer for an animal rescue organization, help out a struggling friend, sign up for a walk or marathon event. Both of today’s Symbols seem to be tuning into the watery (the Moon is in Scorpio) Void-Moon energy and the Mars/Neptune connection. In the Kozminsky Symbol, there’s propulsion (Mars) in a watery environment, but the movement is not frenetic, the scene is serene. It’s telling us that it’s OK to give ourselves a time out (note the reference to the Hanged Man tarot card, above). There’s great satisfaction to be found in Nature and in appreciating the basics (Taurus is the “meat and potatoes” sign of the zodiac, after all.) Since we’re picking up on other people’s energy so strongly, spending some time alone outside or in seclusion may soothe the neurons and keep them from zapping out today. The Sabian Symbol relates to the Bible story of Jesus’ revealing his divinity to a woman who is an alien and an outcast, rather than to the expected big shots. It’s one of the reversed symbolism Sabian Symbols, and reversal seems to be one of our themes of the day. The swan swimming alone, the Hanged Man twisting in the wind, the outcast woman—all of these are outliers, outsiders, and they’re all going it alone. Jesus’ friendliness to someone no one else noticed brings in our Mars/Neptune theme of selfless service to all. Reach out where you can. Let go of preconceived notions about other people or groups and give from the heart, unconditionally. On the down side, don’t let others take advantage of your good nature. The Neptune connection can bring in illusion/delusion, or else we see what we want to see rather than what is really going on. Don’t take on more than you can comfortably handle. It’s better to do one or two small things that actually help than to promise 20 astounding miracles and deliver zilch-o. “Beginnings and Endings”. This card combo gives us a short-form reading on yesterday’s eclipse. The Page of Cups shows the beginning of our understanding of love, particularly self-love. We start off a little self-involved (in the Mythic Tarot, this relates to the myth of Narcissus). He’s probably been admiring his own reflection in that swan pond illustrated in the Sabian Symbol. Something’s being born here; we’re taking baby steps. The 6 of Swords shows where we lose our innocence. There’s a sense of isolation in both cards, but in the Page of Cups it’s because we’re so intensely focused on discovering ourselves, and in the 6 of Swords we’ve pulled back into ourselves into order to absorb a recent loss or deal with a difficult situation. This eclipse reminds us that in order for something new to be born, the old must be left behind or cut away. Some of our problems can only be solved by eliminating the cause of the pain. It’s possible that when we started we were so wrapped up in our own feelings that we didn’t understand the ramifications of the situation. The 6 of Swords says we now realize that it’s time for a sea change. This combination can mean leaving a relationship. It it can also indicate that we develop a new, more mature relationship with ourselves as we realize we haven’t gone deep enough. Once we make that difficult decision, however, we are enveloped with a feeling of peace. 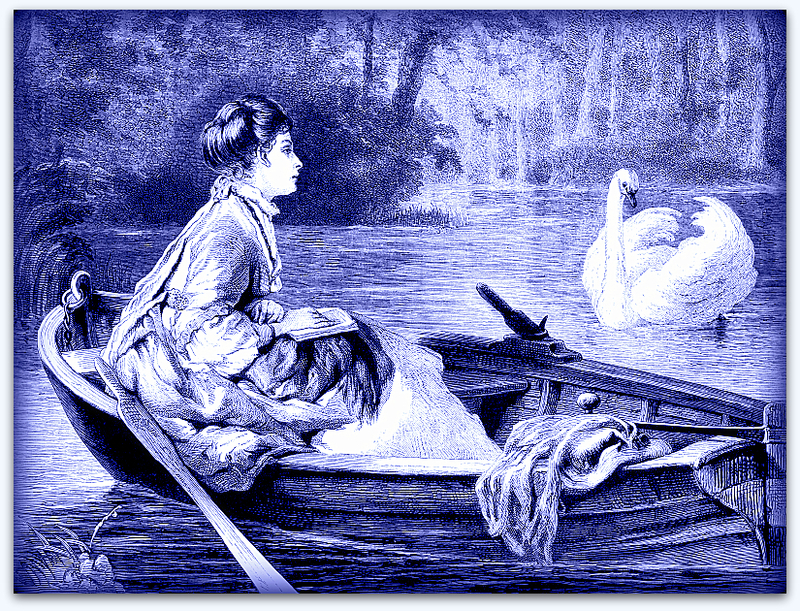 We then have the strength to continue the journey, gliding gracefully as a swan through still waters. ← The Daily Astro for April 25, 2013 Lunar Eclipse at 6 Degrees Scorpio!